When you’ve got a hankering for potato chips or another snack, don’t just mindlessly eat from the bag or box. Instead, portion out a single serving into a small bowl. This way, you know exactly how much you’re eating and aren’t left mindlessly munching until the bag is empty. In the rush of daily life, it can be easy to see mealtime as just another to-do. But rushing through meals can make you eat too much since it takes your brain awhile to register that your stomach is getting full. Put down your fork between bites to take your time and really savor your food. Pay attention to what your body is telling you. Stopping when you're satisfied, not full, will make you feel better in the long run. Use this guide to gauge your hunger and fullness levels. If you're going out to a party or restaurant where you know you'll be tempted to overeat, have a small snack before you leave the house. This way, you won't be ravenous when you're faced with a menu or buffet full of tempting treats and will be able to make more rational decisions. It has been suggested that eating five or six mini meals could help reduce blood sugar swings and curb out-of-control hunger. Some people prefer this method, while others like to stick with three square meals a day. Try experimenting to see what works for you! When you’re out to dinner, start with a broth-based soup. Broth soups are lower in calories than creamy options and will take the edge off your hunger before your meal arrives. One recent study found that spending more time in front of the television leads to a higher consumption of unhealthy snacks and drinks. Be sure to skip the reruns while you’re noshing, and don't forget about other distractions like your smartphone or computer. You can tweet about your meal when you're finished with it. Find out if you're a distracted diner here. It’s common to confuse thirst with hunger, so make sure you stay hydrated during the day. If you think you may not be truly hungry, drink a glass of water first and wait a few minutes. Often, the water will hit the spot if you're only thirsty, but hunger will intensify the longer you wait. Either way, studies have shown that drinking water before you eat a meal may also help you eat less overall. It can be easy to set your eating schedule by the clock, but this sometimes means that you’re eating a meal when you’re not actually hungry. This tactic only further confuses our bodies and inhibits us from noticing and responding to true feelings of hunger and fullness. Instead, make a concerted effort to listen to what your body is telling you when mealtime rolls around. You may find that you’re not even hungry and are just eating out of habit! Once you do start feeling those tummy twinges, get your chow on. Sometimes a meal is so delicious that you have a hard time calling it quits. But remind yourself that what you don’t eat now will be available for leftovers later. Your future self will be very excited that your past self showed a little restraint! If you keep a food in sight, especially a tempting one, you're more likely to eat it. So don’t keep sweet treats or trigger foods in plain sight. Hide that candy jar on your desk, and place treats or snack foods on the highest shelf out of sight in your pantry. It's easier to avoid temptation when it's not staring back at you every time you open the cupboard. When you eat on the run or in your car, you're more likely to grab convenience foods (think high calorie and fast-food items). If at all possible, try to eat at home. A recent nutrition study suggests that people eat healthier meals in the comfort of their own homes. Stock your kitchen with healthy items you can grab in a hurry so that you don't have to take desperate measures away from home. If you do have to hit up fast-food to cope with your craving for a burger or fries, choose the regular hamburger or even the junior or kids sizes. You'll satisfy your craving without indulging in a caloric disaster. Dinner plates have expanded in diameter over the years, and so have our waistlines. Filling a larger plate can cause you to scoop up (and eat) larger portions. Downsize your dinner plate to trick your eye and brain into eating less. 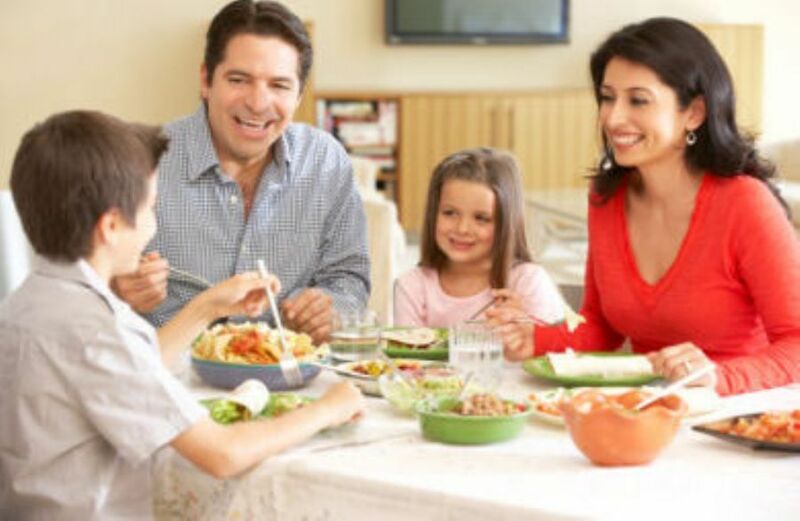 The next time you sit down to a meal with family or friends, slow down your eating and really contribute to the conversation at the table rather than letting it become secondary to your meal. This will give your brain time to register that you're getting full and you will naturally consume less food, all while getting in some quality face time with the ones you care about. When at a restaurant, ask the server to bring a to-go box at the same time he or she delivers your meal. Restaurant meals are notoriously large in portion size and calories, but it can be hard to resist eating everything on your plate. Pack up half of your meal as soon as it's served and you'll automatically save half the calories and fat (plus stretch your dollars and have a delicious meal for dinner or lunch the next day)! If you feel weird about boxing up your meal when it's served, plan to split your entree with a dinner partner when dining out. You may have to pay a "split meal" fee, but better than splitting your pants seams, right? When you’ve finished eating, but still feeling hungry for more, wait. Give yourself five minutes to let your fullness level register with your brain. If you’re still hungry when the time’s up, go back for a modest portion. When you're out with friends, it can be easy to sip on alcohol, lose your inhibitions and start throwing your healthy eating habits out the window--not to mention that alcohol calories add no nutritional value to your diet. So drink in moderation and alternate each drink with water, or skip the alcohol altogether and remain strong in your healthy eating convictions! By the time your brain registers the fact that you're full, you're often too full. To avoid overfilling the tank, stop pumping before you hit the full mark, so to speak. Eat only until you're no longer hungry-- not until you're so stuffed that you have to add a notch to your belt. Some studies show that drinking diet soda can still put you at risk for obesity and type 2 diabetes, while triggering your appetite and sugar cravings. If you get thirsty, water is always the best choice! Add in a splash of 100% fruit juice to spruce it up. The easiest way to start eating less is to implement a variety of simple changes that you can stick with for the long haul. That, plus a little patience and planning, will go a long way in helping you cut down your calorie intake to reach your weight-loss goals. The surefire solution for weight loss is to burn more calories than you consume by exercising and eating less. But as anyone who has ever tried to lose weight knows, ''eating less'' isn't always easy. Luckily, these tips and tricks will help you enjoy your food, consume fewer calories and help you train your brain to stop when you're satisfied--not stuffed!